Using the LAMOST data, Dr. Qianfan Xing and Dr. 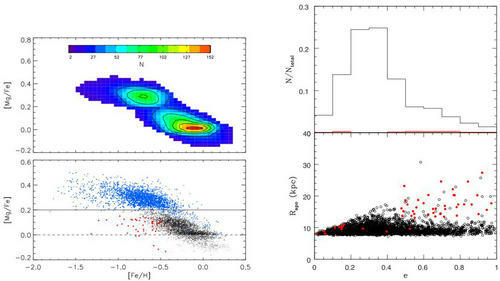 Gang Zhao from the National Astronomical Observatories of Chinese Academy of Sciences (CAS), analysed the Mg abundances of F- and G-type dwarf stars and find evidence for accreted component in the Galactic thick disc. These accreted stars possess relatively low Mg abundances with high orbital eccentricities and high maximum Galactocentricradii, providing observational evidence to support a gas-rich merger origin of the Galactic thick disc. The presence of thick stellar disc in the Milky Way has been established for decades. However, the dominant formation mechanism of the thick disc is still unclear. The radial migration scenario suggests the thick disc is created from stars migrating outward from the inner part of the disc; Models of disc heating propose the thick disc is composed of stars heated by minor mergers of satellites; In the accretion scenario, stars from infalling dwarf galaxies compose the thick disc; Gas-rich merger models suggest the accretion of a gas-rich merger results in the formation of the thick disc. The accretion of stars originated from dwarf galaxies are involved in both accretion and gas-rich merger models. But the proportion of accreted stars and stars formed in-situ is different in two models. It is important to determine the role played by accreted stars in the formation of the thick disc. This work investigates the properties of the Galactic discs using F- and G-type dwarfs with distances and proper motions. The sample stars are assigned into different stellar populations by using kinematic criteria. The thin and thick discs are well separated from each other by a relatively low-density region of [Mg/Fe] (Fig. 1). Compared to the thin disc, the thick disk is composed of metal-poor and alpha-enriched stars, indicating the thick-disc stars are born earlier than most thin-disc stars. A few of metal-poor stars with the kinematics of thick disc are found to possess relatively low [Mg/Fe]. They do not follow the general [Mg/Fe] trend of the thick disk and are chemically similar to stars in satellite dwarf galaxies. Their large apogalactic distance and orbital eccentricity allow them to reach positions far away from the Galactic centre, suggesting they were formed in dwarf galaxies and confined to the thick disc after the accretion events. The existence of accreted component in the thick disc confirms the contribution from the dwarf galaxies for the formation of the thick disc. However, the proportion of accreted stars is relatively small in contrast with thick-disc stars formed in-situ, far below the prediction of the accreted model. Composed primarily of stars formed in-situ, the thick disc possesses a few of stars accreted from dwarf galaxies, in consistent with the gas-rich merger models. Moreover, the distribution of eccentricities in the thick disc is in good agreement with the gas-rich merger models. Figure1: Location of sample stars in the [Mg/Fe]-[Fe/H] plane. The normal thick-disc stars are shown in blue circles, and the low-Mg stars are highlighted with red circles. Figure2: Distribution of rapo with respect to eccentricity for thick-disc stars. The low-Mg stars are shown in red circles.